Villa Badoer is a Villa designed by architect Andrea Palladio, built between 1556 and 1563 in Fratta Polesine, about 20 km from Rovigo. Badoer is the name of the aristocratic family who commissioned it. Villa Badoer, together with the other Venetian palladian Villas, is a Unesco World Heritage site. Due to the risk of flooding, Villa Badoer stands on an embankment specially designed. The resulting elevation gives it prominence. The façade is characterized by a loggia with Ionic columns which is accessed by a staircase. The colonnade supports a triangular pediment. On both sides of the Villa there are two semicircular colannades. 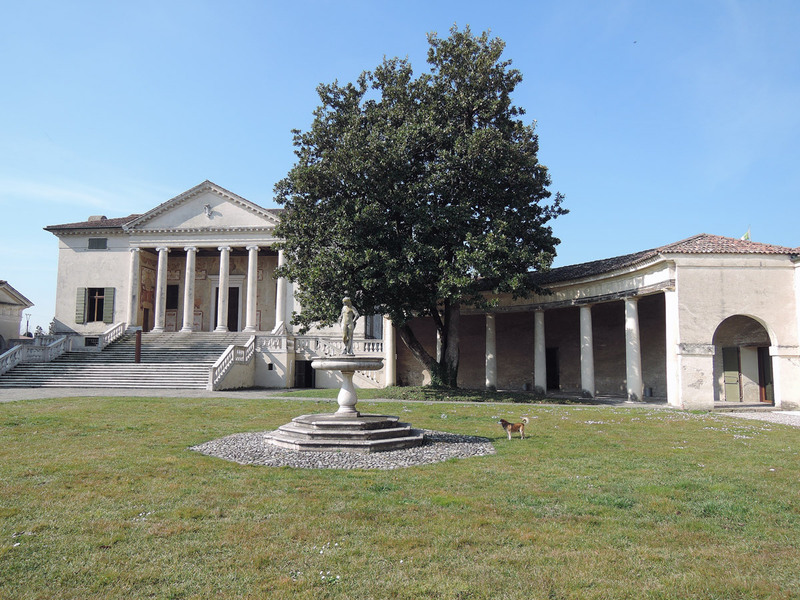 It is the only Villa by Palladio with this peculiar appearance. The colannade on the right houses the National Archaeological Museum. If you want to learn more, you can read my post about the Archaeological Museum of Fratta Polesine. Inside you can admire the colourful frescoes of Giallo Fiorentino, representing mythological and allegorical themes. I decided to visit Villa Badoer because, I confess, it was one of the few already open. Many villas open in March or April, and it was the end of February. While I was in the car I was very curious, because along the way there were only fields, fields and more fields. I wondered: What will there ever be here? But I was wrong. We (I was of course with my husband) parked along the canal Scortico (funny name, sound like peel or scrape), flanked by a bike path that goes from the river Po to the river Adige (that must be a very interesting and enjoyable experience). We immediately saw not only Villa Badoer but also a second Villa located a few hundred meters before (Villa Grimani Molin Avezzù). In fact the whole village, however small and not well-known, presents beautiful examples of architecture, testimonies of a glorious past. The ticket price is 3€ for the Villa and 3€ for the Museum, but the friendly staff explained that we could have the “Fratta card” (4€) and visit both. The interior is quite bare. There are only a few panels explaining the remediation of the surrounding countryside and the importance of the Villa. Only in Italian. At this point you can reach the first floor (by stairs only). There, you can admire the frescoes with mythological and allegorical subjects. Their meaning is difficult to understand because there is no explanation whatsoever. The frescoes are bizarre and beautiful to look at, but there’s no masterpiece. Unfortunately they are also damaged in many parts, due to an intervention occurred in past centuries. The villa was used in fact as a warehouse for a period and the frescoed walls were therefore covered with plaster. To attack the plaster it was necessary to make some kind of divots on the walls. Only around 1960s it was decided to remove the plaster. The frescoes have resurfaced, but the divots have resurfaced too. Apart from the frescoes the rooms are empty. Beautiful the view over the rear garden and countryside, though. At this point you can go up (pay attention when you go down because some steps are really narrow) and you get to a room very dark and bare. If there are no current exhibitions, I suggest you to skip this one. At this point you can go back to the first floor and exit to the loggia. The garden of Villa Badoer is small but beautiful, with some benches on the bottom and two wonderful magnolias on the sides of the Villa. There was a dog hanging around. And now I must confess that I am afraid of dogs. I was worried but he paid no attention to us at all. To the left of the Villa there is the toilet, spacious and clean. A very curious thing was seeing a young man in the garden that has remained in ecstasy in front of the Villa the whole time of our visit, and beyond. Later, while visiting the small museum, the young man came in and talked a bit with the staff. Well, he had arrived there by bicycle, leaving home at 6 am! 55 km from a small town of the Euganean Hills in about 4 hours. I saw his bike, and it was a normal bike without gears (is gear the correct word?). Congratulations to him, especially because he had to get back home! Back to us. In conclusion I was glad to discover this Villa. Apart from us and the bike-guy there was no one else, so we were able to enjoy the visit with calm and intimacy. The weather was nice and sitting in the garden to admire the structure was pleasant, even romantic. The staff members were really friendly and smiling. The price is correct. If you are in the area, I recommend a visit.